It’s hard to believe that some children, especially those living in urban areas, have never experienced Michigan’s great outdoors. “Every day is a wonderful day for me because I get to watch the faces of children who have never once been out in Michigan’s waters, woods or on a nature hike. But once they’re out there, they’re mesmerized,” said Gary Williams, Michigan Urban Natural Resources’ outreach programs coordinator. Nearly 3,000 inner-city children will experience the great outdoors this summer thanks to a program called Stepping Stones. 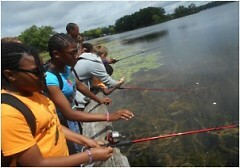 Michigan State University Extension and the Michigan Department of Natural Resources developed Stepping Stones in 2010 to provide urban youth with fun educational experiences in Michigan state parks. “I would say a great number of our Stepping Stones participants have never been out of the city. So for them to have this hands-on opportunity, it can really be life-changing,” said Williams, who serves as the program’s director. The free summer program is incredibly popular; all 97 sessions for 2017 are already filled with up to 30 children each day from public libraries, churches, YMCAs, day camps and other youth organizations. Sessions are offered weekdays from June 19 to Aug. 11 at eight locations: Belle Isle; Maybury, Hoffmaster and Sleepy Hollow state parks; and the Proud Lake, Island Lake, Holly and Bay City state recreation areas. Stepping Stones is geared for children ages 9 and older and includes lessons on fishing, archery, camping, nature exploration and water studies. Not only do the kids love the activities, but 90 percent of the 2016 participants also said afterward that they wanted to return to a Michigan state park in the future. And that’s the entire goal. Most of the Stepping Stones participants have little or no experience outdoors. 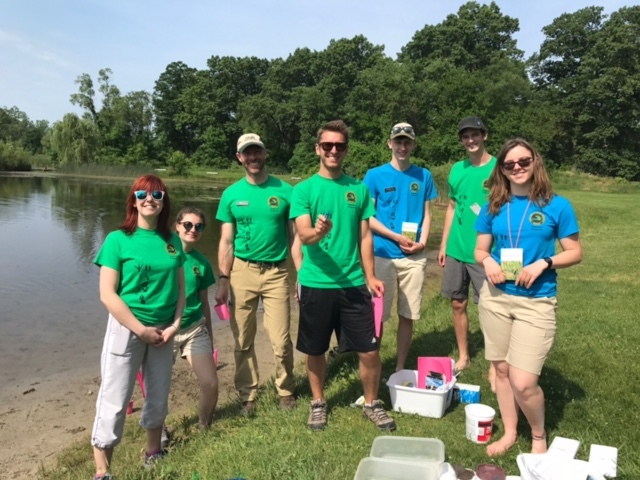 But playing – and learning – with their own two hands can have a huge impact, said Jeff Poet of the Michigan Wildlife Council, which was created three years ago to educate the public about how Michigan’s wildlife and natural resources are managed and how those activities are funded. Dedicated scientists and volunteers perform the bulk of the wildlife management activities that take place every day across the Great Lakes State – work that is funded primarily through hunting and fishing license sales, Poet notes. “Meanwhile, programs such as Stepping Stones are helping to build the next generation of stewards,” he said. Williams agrees that the more kids can explore their environment, the more likely they are to take an active role in conserving it. “This is the next generation that’s going to be responsible for caring for our environment, and what better way to get them to learn responsibility than to educate them while they’re having fun?” he said. Stepping Stones provides all the necessary equipment: fishing poles, bows, targets, tents, water sampling kits and more. Williams hires four seasonal staff members to help teach the program, which also receives assistance from state park explorer guides. This is 29-year-old Sarah Dickson’s second summer working with Stepping Stones. The Redford resident has a bachelor’s degree in biological science with an emphasis in wildlife ecology and spent much of her youth playing outdoors. “I love being outdoors, interacting with children and getting them excited about nature, which is so close to them but which they often don’t get to experience,” Dickson said. Most of Dickson’s days are spent at Maybury State Park, Island Lake Recreation Area and Holly Recreation Area. She most enjoys teaching water studies, in which the children must venture into the water to take sediment samples and then view them under a microscope. “Water studies is where you see a complete 180-degree turn for kids that don’t know anything about being outside. 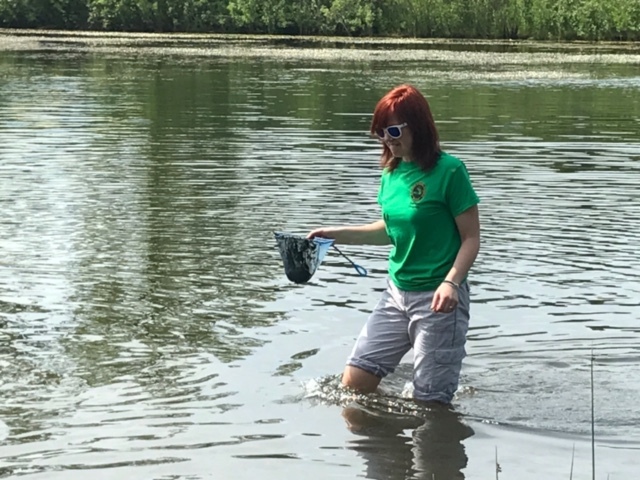 We’re making them take their shoes off, get in the water and put their hands in the muck to look for microinvertebrate samples,” Dickson said.